I took a break from blogging this weekend to enjoy the first one I’ve had in more than a month without any big plans. I love plans as much as the next gal, but relaxing at home and just puttering around has been a great and much needed change. One of those weekends where I actually did pretty much everything I wanted. I worked on the quilt, cooked, read, had brunch with my mother and went fabric shopping, looked through magazines that had been piling up since winter, went for an Indian Head Massage for some migraine relief, watched the Netflix movie that’s been lying around here since April, finished another audio book, shopped some summer sales online, made a new playlist for my commute, and topped it off with Adam and I playing with the grill for dinner tonight. Even my relaxation is busy. But it’s the first weekend in ages where I don’t have the Sunday Night Blues because I did so much fun and productive stuff. And I discovered my new favorite vegetable dish, something I consumed in embarassing quantities at dinner leaving Adam with just 5 sad little pieces from that plate. 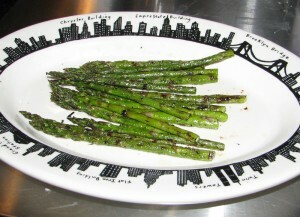 Grilled asparagus. 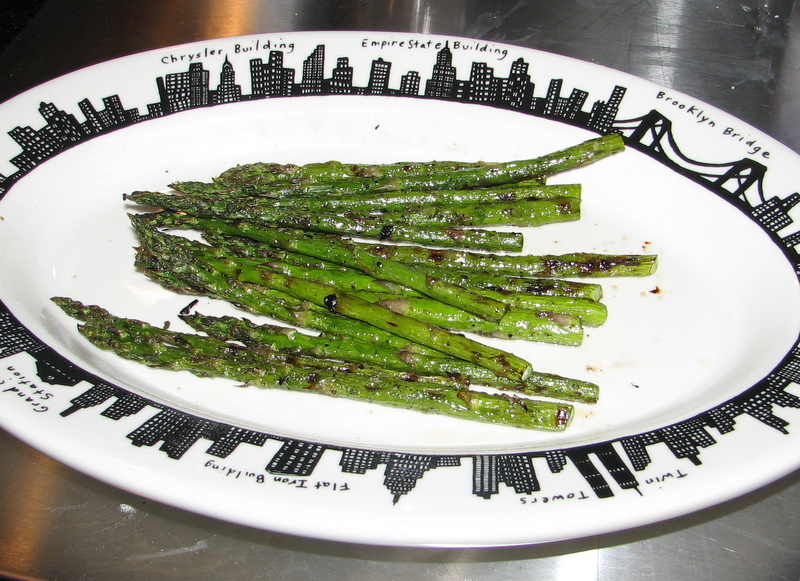 I love asparagus anyway, but I drizzled on my Meyer Lemon olive oil, salt and pepper, and Adam tossed these on the grill with the steaks he was expertly preparing. Five minutes later we had the most delicious side dish ever. And it was so easy. I could eat a whole plate of this asparagus for lunch. Or dinner. Possibly even breakfast. Now I’ll have to learn what other magical combinations of greenery and grilling I can make.